Includes both regular and high-altitude versions. 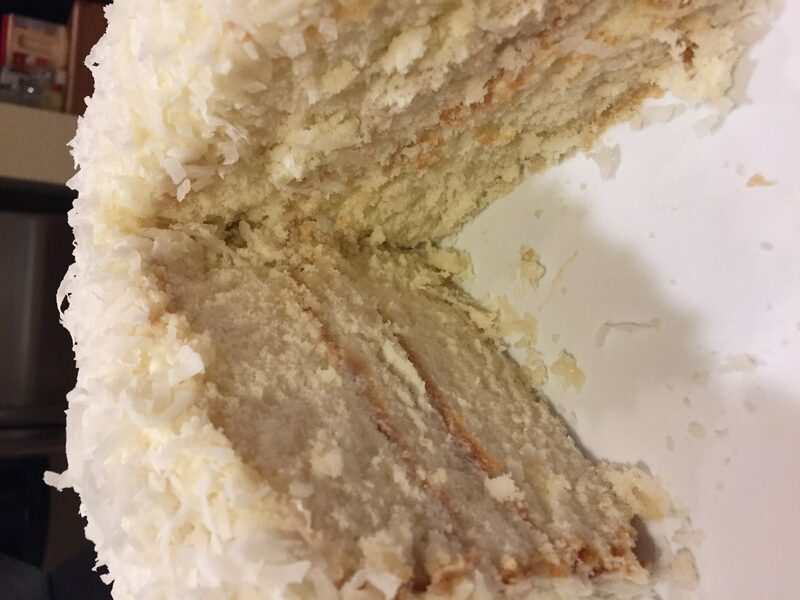 I’ve finally found the best homemade coconut cake recipe. It doesn’t use white cake mix (with it’s sickly-sweet taste and gummy texture). It does use all-natural ingredients, with no artificial flavors or colors, so you can feel good about serving it to your family. And I found it to be an easy coconut cake recipe, once I worked out the right proportions. But I put that apron back on and sat down with pen and paper and worked it out. You can do this yourself by following my instructions here. 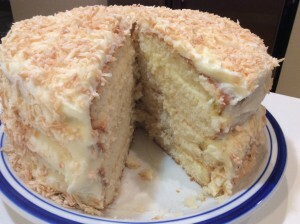 I’ve provided both the high-altitude and regular altitude recipes for this Old Fashioned Coconut Cake so that you can pick which one works for you. 1 tbsp Natural Coconut Flavor See below if your store doesn't carry this. 3/4 cup Unsweetened Coconut Milk, 15% fat content Use the canned, not boxed version. It must be at least 15% fat. Whisk the egg whites, milk and coconut flavoring until frothy. (We will use these bubbles for the leavening to expand as the cake bakes). Set aside. Pour the thick batter into the prepared pans. I use a small postal scale to weigh them out so that I divide it evenly. Bake for 36 to 40 minutes, then test with a toothpick to see if it comes out clean. Add two minutes more if it comes out wet. Remove from the oven and let cool for about 10 minutes, then remove from pans and cool completely on a rack. While the cakes are cooling, use the warm oven to toast your coconut (optional). 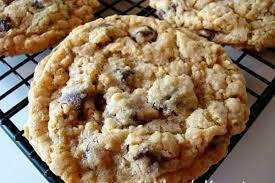 Simply sprinkle the coconut on a cookie sheet in a thin layer and set it in the oven at 350 F for about two minutes. Stir the flakes and watch them for another minute or so. When they’ve toasted to golden, remove and cool. Cream together the cream cheese and butter. Add the coconut flavor. Then add the powdered sugar, one cup at a time. I cover my mixer with a very light tea towel to avoid sugar powder spreading all over the kitchen! Once it’s smooth, add a tablespoon of the coconut milk or regular milk to achieve a spreadable consistency (I didn’t have to add any). For the filling, simply whip 1 cup of heavy whipping cream until medium peaks form, then gently blend in 1 cup of the cream cheese icing. 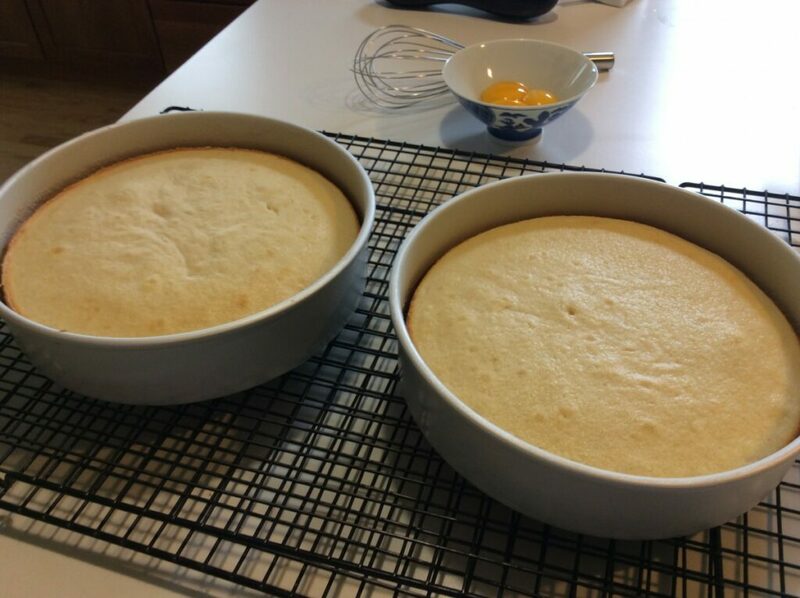 I divided my cake layers into four pieces, using a cake leveler. I used the whipped cream between each layer, then iced the outside of the cake with the cream cheese frosting. 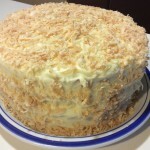 Lastly, I sprinkled the toasted coconut, using my palm to “bounce” the flakes onto the sides of the cake. That’s all there is to it. This is NOT a difficult cake to make! And the results will get you “oohs” and “aahs” from friends and guests. Here’s the high-altitude version. I showed a picture of the toasted coconut version here – sometimes it depends on my mood, what type I prefer. This is the high-altitude version of my Old Fashioned Coconut Cake recipe. It adjusts the flour (increase), sugar (decrease), liquid (increase), baking powder (BIG decrease! ), bake temperature (increase) and bake time (decrease). It is adjusted to 5,280 feet, but if you are significantly higher, you'll need to change the proportions just a little more to achieve perfect results. See my article on high-altitude adjustments here. 3/4 cup Unsweetened Coconut Milk It should be about 15% fat content. It replaces some of the butter, so don’t use the type in a box you pour on cereal. Preheat oven to 370 F (190 C). In a medium bowl, whisk the egg whites, milk and coconut extract just until frothy. In a mixer bowl, add the flours, sugar, baking powder and salt. Mix with a whisk. Add the butter and coconut milk and mix on low with a paddle attachment just until moistened. Add the egg white mixture in a few additions, mixing just until incorporated, then beat for two minutes. Pour the batter into the prepared pans. I use a small postal scale to weigh them out so that I divide it evenly. Bake for 31 to 34 minutes, then test with a toothpick to see if it comes out clean. Add two minutes more if it comes out wet. If the icing is too thick for spreading, add a teaspoon or two of coconut milk and blend to the desired consistency. You can make your own natural coconut extract at home. Food Network has a good recipe with techniques to make it a bit easier. 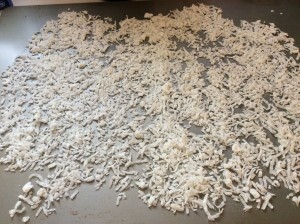 Frankly though, I’ve found it to be pretty tedious – especially separating the coconut meat from the husk. You can easily find artificial coconut flavor in any store, but I refuse to use it. It just doesn’t have the depth of flavor you need in baking. And since you’ve used all-natural ingredients throughout, why mess it up with artificial flavoring? Thanks for visiting Baking Naturally! Please leave a comment below. 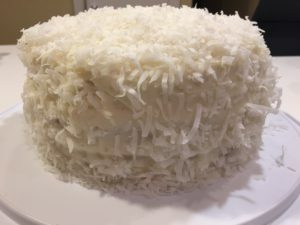 I have been looking for some cake recipes and i came across your post:) i love coconut and this recipe looks ideal, even better as it is old fashioned and they deffo taste the best. Do you know roughly how many people this would serve? as we have a family party coming up and i really would like to impress them with this cake. This cake will serve 12, unless someone is just totally starving! Haha. It also keeps really well under a simple glass or plastic dome. Enjoy! Do you use coconut milk from a can or the refrigerated type that people use on cereal? I use coconut milk from a can. It has to have a high enough fat content. The kind I use is about 17% fat. It replaces some of the butter, so you can’t just use the cereal type. Thank you thank you for the high altitude recipe! After several failures of other recipes, finally a beautiful, delicious cake! I am SO HAPPY to hear it! Living here in Denver, I GET IT. Enjoy! I love eating coconuts but haven’t tried a coconut cake myself. Valentines day is coming soon and I am planning to at least bake something delicious as my boyfriend loves to eat cakes but he is not a fan of generic cake flavours like chocolate, strawberry and vanilla. I also use coconut milk in most of my savoury dishes and coconut milk made it taste so much better. 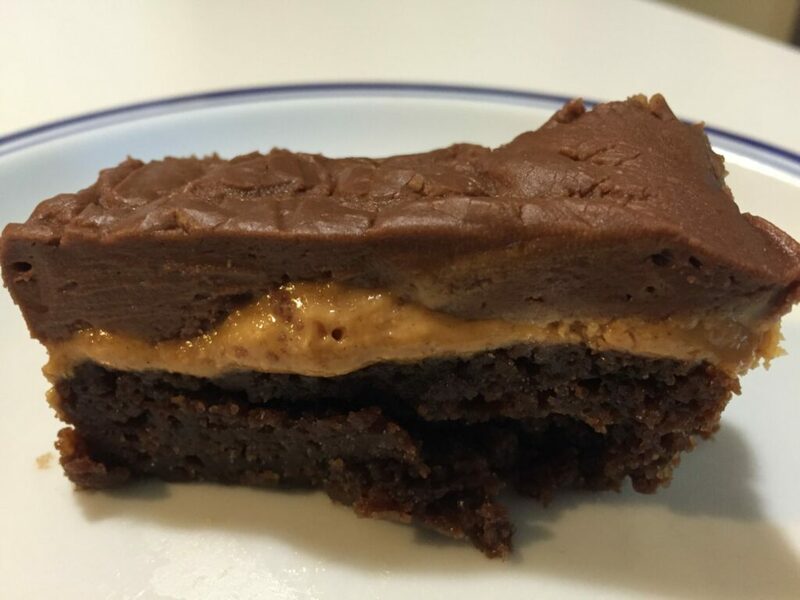 My friends have made this one numerous times and have specifically come to me to tell me how well it turned out. I think you’ll really like it. I love coconut cake! I really like this recipe and I’m so glad it doesn’t include the boxed white cake mix which is really sweet. Your cake looks beautiful! I am bookmarking this page. Baking this cake is now on our to-do list. We bake often so I’m looking forward to trying this out. Thanks for the recipe! 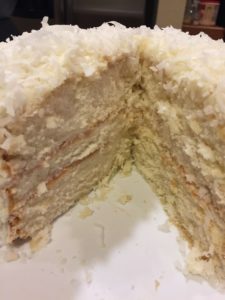 Very tasty sounding coconut cake recipe, I will try this recipe myself very soon since it sounds much healthier than what you can buy in any stores. I like it is low on sugar, coconut is very healthier for you and this would be a healthy cake to serve for desert and special celebrations. You will not be disappointed, Jeffrey. It turns out perfect every time, moist and full of coconut flavor. My friends DEMAND that I make it when they come to dinner!